Several weeks ago, I was fortunate to attend a TEDx event at Eastside Prep. Several speakers really spoke not only about what’s wrong with much of our education system (that would be too easy to do). They also spoke of changes that would enhance learning – the real kind of learning where you take risks, sometimes fail, but persevere until you get it. The reward is intrinsic. The value and motivation comes from the learning itself. For example, changing the schedule to allow for longer deeper inquiry or assessment without grades. Honestly, if I was evaluated on a grading system rather than through goal setting, feedback, and reflection, I wouldn’t do it. So why do we do this with kids in middle, high, and even some elementary schools? I’m glad people are motivated to put on events TEDx events focused around education. There’s another TED education event in this area, TEDxOverlake (How People Learn,) happening on June 18. This week, the videos of these talks were posted, and I wanted to highlight a couple of speakers that addressed the above in different but concrete and passionate ways. The first is by Shawn Cornally, a high school math and science teacher called The Future of Education Without Coercion (you should also check out his blog, ThinkThankThunk. The second is the talk by Dr. Tae whom I wrote about a few weeks back. His talk was titled: Can Skateboarding Save Our Schools? If you’ve read Daniel Pink’s Drive, read Alfie Kohn’s Punished by Rewards, seen the movie Race to Nowhere, or heard Sir Ken Robinson speak or read his book The Element, a very similar theme emerges in all of them. At the TEDxEastsidePrep event I attended last week, there was one speaker told a very compelling story. Marcus Brotherton is an author, journalist, and, according to his speaker profile, an adventure motorcyclist. Invite people to tell their stories. Imagine the world through other people’s eyes. With many education leaders talking about the brewing change upon us, and the challenges that lie ahead if we don’t adapt, Brotherton reminded us of what I think is the most important element in education – the connection between a student and teacher (that teacher may be another student, a parent, or anyone willing to make that connection). Brotherton also demonstrated very well that storytelling is a very effective way to do this. Empathy is a 21st Century Skill. Our students need to develop it, and so do we. I’m still working on mine. What could education look like in the next 5-20 years? What paths must we follow to develop engaged citizens in a digitized age? What assumptions about our current education systems no longer hold based on new capabilities, new insights and new developments in the fields of brain and behavioral research? What essential attributes must remain in future incarnations of our education system to be successful? I think we know which question this speaker addressed. I attended an incredible event at TEDxEastsidePrep today. The topic was: Evolution of Instruction: Inquiry, Innovation, Identity and it exceeded my expectations. I tweeted a couple of nuggets I got from each presenter and I wonder if that will encourage teachers to take a risk with twitter as a learning tool. There’s an overwhelming amount of great things to share, and perhaps I’ll write about all of it. One speaker, Dr. Tae was off the charts. A physics professor and avid skateboarder, he talked about what has been a common theme at our school: Learning by making mistakes. He walked through a trick he wanted to learn by showing us a shortened video of his progression. He got it on his 58th try. That meant he FAILED 57 times. There was no physical incentive for this trick other than the accomplishment of the act itself. There were no letter grades (an F for his first attempt, maybe a C+ near the middle). He only had a clear goal, persistance, practice and hard work. How are our children learning? Are their learning tasks as relavent, engaging, and clear to them? Do they persist or do they give up easily? All extremely good questions to ask oneself and their students. Here’s a video on Dr. Tae’s blog that gives you an idea of what he means when he says we need to build a new culture of teaching and learning. The end of the school year is upon us and it’s a fairly busy time, but I hope to share one nugget from all the speakers. The word “failure” has such an awful ring to it. It is, however, how we learn. In order to do so, though, one needs to take risks. It’s something that I ask my students to do every day, and I am often in awe at their willingness to put themselves out on a limb and try new things. And if I’m asking my students to do this, am I modeling it for them? As adults, risking and failing can be difficult to do, but we must. The important thing, though, is that we do it fast, and learn quickly. Last week, at a suggestion of a friend in celebration of poetry month, I introduced my kids to Clerihews. They’re short four line poems that have no particular rhythm or meter. They do have an aabb rhyme scheme, and the subject of the poem just has to be about a person (real or fictional). We decided to write them using powerpoint. We focused the instruction and questions on the poem and then headed to the computers to create our slides. What amazed me was how quickly kids took risks, clicking buttons and trying new things to add elements to their slide. When some had questions like, “how do you change the font?” I simply replied, “Look at all the buttons and tools and see if you can figure it out for yourself.” Of course, they did. The risks they had to take – first with the poetry, playing with words and rhyme, and second with a tech tool they had very little practice using, didn’t faze them one bit. The only ‘failure’ was a child who didn’t save his work to his file, but he learned something valuable and he learned it quickly. How often do teachers take risks, and whether they fail or succeed, are they learning from those risks? We can learn so much from our mistakes. If we allow ourselves. I was thrilled to hear our that we secured Sal Khan for the keynote at the fall conference for PNAIS (a committee I’m proud to be on). I’m excited not because of his product (I’ve actually experimented with Khan Academy a little bit with my students and it has its shortcomings), but I’m excited because of he brings the innovative message of flipping the classroom. I’m excited about the risk involved in bringing on a speaker like that to a group of teachers. I’m excited at the potential learning, discourse, and discussions we are sure to have. April’s issue of the Harvard Business Review was all about failure. And the TED talk below from Kathryn Shulz on being wrong really highlights the importance of learning from mistakes. He sums up what many colleagues have been saying for years – that EQ is just as important as IQ, if not more. We do, however, have to be reflective about our biases. By nature, humans need to be social, but according to Brook’s research, it’s the quality of the social connection that matters, not just the superficial connection. I keep seeing these terms, ‘mindsight’; ‘theory of mind’; ‘sympathy’; ‘group IQ’ (although Brooks says it’s less about IQ than the quality of connections among the group) in most of the books I’ve read over the past couple of years. Learning how to empathize and using one’s emotions to drive one’s reasoning are extremely important skills to grow. Early in his talk, Brooks mentions what many of my colleagues and I have said: we can build a fancy school building (and we did), but it’s the connections we make and the values we share with each other, the parents, and kids that make a great school. I’m lucky as we’ve got that too. It’s been an exceptional year of TED talks and I highly recommend this one. Will you take the 18 minutes to watch it? Of the TED talks given last week, this is the one of the ones I was anticipating the most. Human interaction is crucial to learning, but that interaction is just part of it. Can a robot or youtube video do my job? Only if I stand in front of the class the whole time and lecture. Sure, listening is an action, but doing something more interactive like student-student or student-teacher is a much more valuable use of their time. I had a few colleagues come back from the NAIS conference recently and really liked Sal Kahn both as a speaker and what he had to say. It really shifts the paradigm of traditional schooling, but as an educator, it also makes sense in many ways. I still need to explore Kahn Academy’s website and materials more thoroughly, but after this talk, I’m convinced I really need to. Best of all, it’s all free! Last week, in celebration of Dr. Seuss’ birthday, our class read his book, Oh the Thinks You can Think. It’s a great book about unleashing your imagination and the unlimited possibilities that are all there in your mind. What’s even greater is the story of Dr. Seuss’ persistance (and luck) in publishing his first book which I first learned from a book a colleague gave me titled, Everything I Needed to Know, I Learned from a Children’s Book written by Anita Silvey. I was reminded of Dr. Seuss’ story on her blog: Children’s Book-A-Day. This weekend, I finished reading Poke the Box, by Seth Godin which is a book about taking initiative. It’s a book that basically says you have to do more than simply think thinks. It says you have to ship your product. It’s simple message reminded me more of P.D. 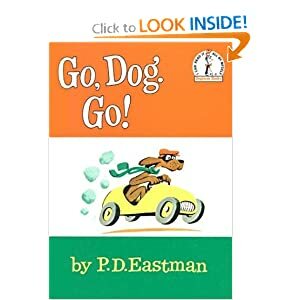 Eastman’s book, Go Dog Go! which sums up the message nicely: Go! In Eastman’s book, he also shows that by putting yourself out there, you have a pretty big chance of being criticized and failing. If you don’t takes those risks, however, you won’t succeed. “Do you like my hat?” says one dog to another throughout the book. “I do not!” replies the other dog. This doesn’t stop the dog who asked the question from redesigning her hat over and over again. She takes the initiative to keep innovating. By the end of the book, he likes her hat. So Silvey is right. Everything you need to know, you can learn from a children’s book. What prevents a lot of us from taking initiative? According to Godin: the fear of failing is one part of it. As educators, we want to instill the value of failing to learn in our kids. How can we do this without being risk takers ourselves? We can’t be completely foolish, or course, but as Godin puts it, we can’t wait for permission either. TED talks are all about people who take initiative. The TED 2011 conference took place last week. While I look forward to learning about some of this year’s ideas when this year’s talks get posted, there are many talks being given in a TED movement called TEDx. These are independently organized events for those who think they have ‘ideas worth spreading.’ TEDxNYED took place yesterday featuring a diverse group of speakers. Its theme was: Empowering Innovation in Education. You could stream the all-day event live or view some of it later. There were a lot of calls to transform education using technology to engage the learner. The views varied among the speakers I watched, but one thing they all seemed to be saying resonated with me having read Godin’s book: We need to engage our kids to take initiative, and to do that, we have to do so ourselves. There were a lot of people who suggested a flaw in the TEDx talks saying that they were all lectures. Godin would say to those people, start your own TED talk and make it more interactive. Don’t wait for someone else to make it happen. Our school’s values statement includes: “We foster resilience and expect all to search and find, to fail and learn, to risk and succeed in a changing world.” According to Godin, taking initiative is an intentional act. We can schedule it. In fact, we’re trying this at our school. Wednesday March 23, after school, our faculty are all going to “start something.” Whatever that something is, I’m excited to find out what they did that afternoon. Poke The Box is a quick and good read. “Indeed, the message of this book is so profoundly simple and so simply profound, I can encapsulate it in a single word. Don’t cogitate. Don’t ruminate. Don’t plan on getting started or wait for permission to begin.